Sadly, and with lots of work, this blog has moved to Blogger. If you want to know why, then its a combination of things, this blog is only web based and we have infrequent internet so to try to encourage more blogging I am blogging on a blog that can be written offline. This blog also seems to muck about with my pictures, if they dont have unique names when uploaded then they get all messed up later, even to the extreme when I found a picture replaced by someone elses photo on one of our posts. So in summary, blog off. 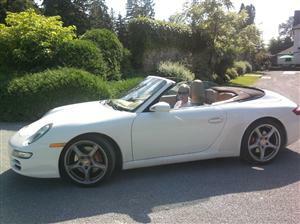 Last week it decided that the summer was over here in Canada. The temperature dropped by 10 degrees and the weather forcast was warning of frost at night. So its time to pack up this house and move south to Florida where the sun shines all day, apart from a 3pm when it rains for 20 minutes to keep the humidity up. Before we left there was time to visit a few more places up here. 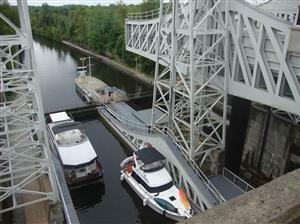 Along the Severn Trent water-way, which connects many lakes with canals and locks so pleasure boats can by pass Niagara, there are a few interesting variations on the classic lock. 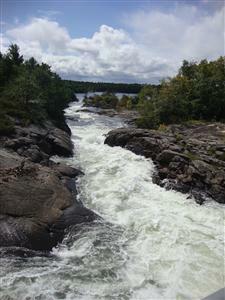 The Big Chute marine railway was made so you don't have to ride these rapids. 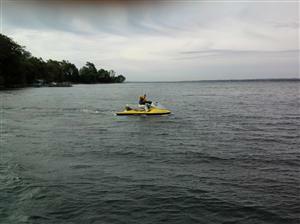 This sled lowers in the water at one side, you drive your boat in and it is lifted into slings on the sled. 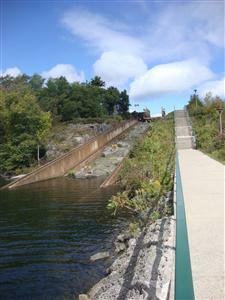 The sled then is lowered down these tracks to the water below. A 10 minute journey, sounds hairy to me. 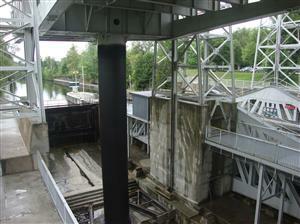 In Kirkfield there is a hydraulic lift lock. 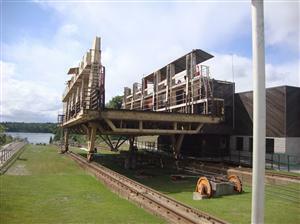 There are two boxes on large hydraulic rams. You drive your boat into the box, the doors are shut and the top lift is loaded with a foot more water than the bottom lift. When the brakes are taken off up (or down) you go just with the extra weight of water. Fast and fascinating. 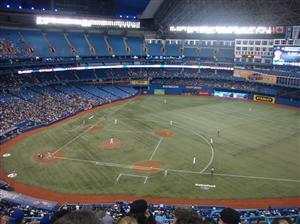 We also managed to visit down town Toronto and see a base ball game. Key points to note, beer is very expensive, $10 dollars a can, glad we smuggled in some wine gums. 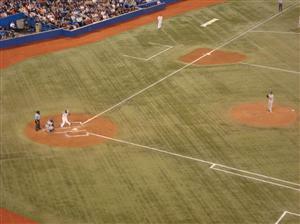 This is the Blue Jays star player who didnt score any points, or runs, or rounders, or whatever they are. Looks like he had a problem with his legs too poor guy. Lastly, if you are a Blue Jays fan, it is not a good idea, like one young lady we saw, to paint the initials of you team name on your cheeks, it may give people the wrong impression. 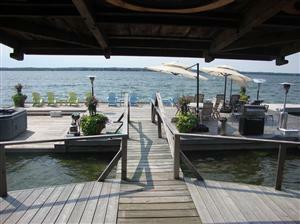 So we are packing up the house, putting away the tennis court, jacuzzi, boats and golf courses. 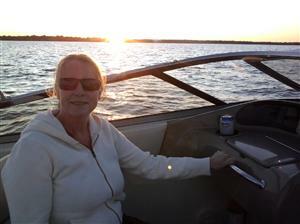 Di bravely voluteered to drive the Jet Ski to the storage place across the lake on a chilly day. Roll on florida. 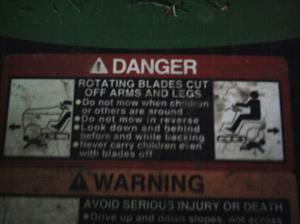 One important note from this sign on my soon to be ex-lawn mower; it seems to be saying, when driving over toddlers, do it in reverse. So its time to head for warmer climes, at what more appropriate a carriage than this, luckily we dont have much luggage. 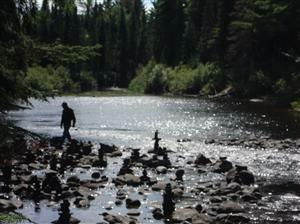 When we have the chace of some more days off we visisted Algonquin National Park further North. 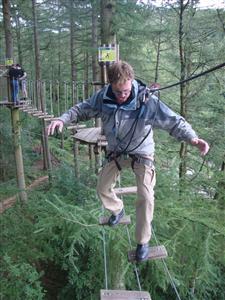 Mostly trees, lakes and paths. 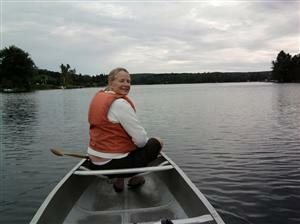 We felt obliged to take a quick trip on a canoe. But after 15 minutes paddling and unable to find the sails we turned back. 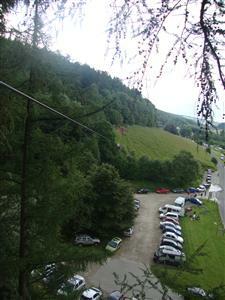 We walked some of the shorter trals in the park and enjoyed the views. 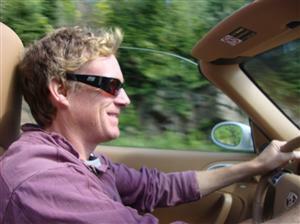 The weather was mostly kind, apart from when we put the top down on the car or went for a walk. 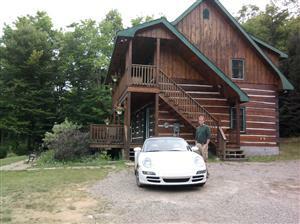 We stayed in a lovely log cabin oin the lake. 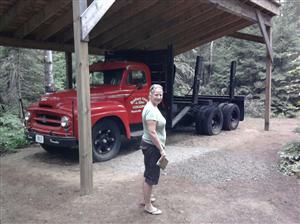 Visited the logging museum and learned all we needed to know about chopping down trees in Canada. 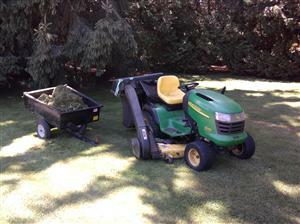 Could wait to get back and start up the chain saw. The drive was always enjoyable. 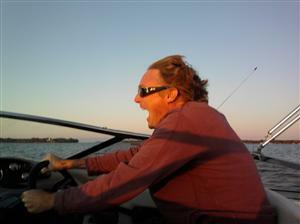 When we have time we like to go for a spin in the boat. Although its nice to be back on the water bouncing along at speed with all that noise does not compare to the tranquility and serenity of drifting along under the power of the wind alone. 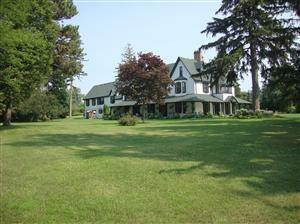 This is Beechwood, our new home for the Summer. 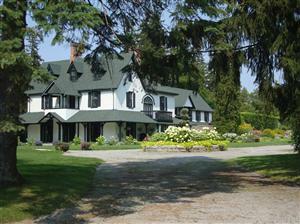 A beautiful House on the lake. 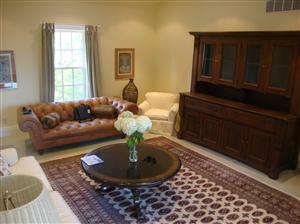 We have a very comfortable apartment with a large bedroom and huge lounge. 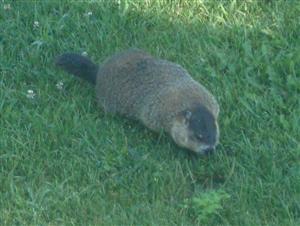 This is our closest neighbour who lives under the porch. 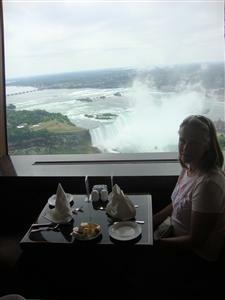 After a hard first two week in the height of the Summer season we drove to Niagara on our first day of and had lunch in a resturant at the top of a Tower overlooking the falls. 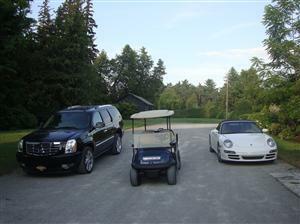 The cars we get to drive, and clean. 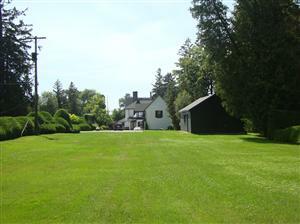 Some of the expansive lawn, that needs mowing. But we have the tools for the job. 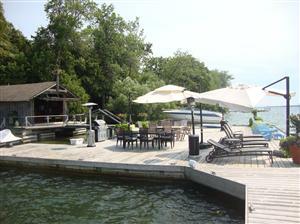 The large dock on the lake. Some people visit the farm, or it comes to you. 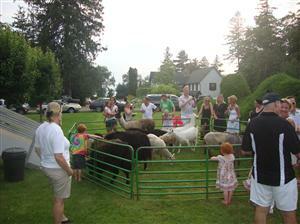 During one busy party a petting zoo came to visit for the kids ( and adults ) to pet. We left Sea Gal in a hurry. Just enough time to cover the hatches and show Geoff how to work the bilge pump. 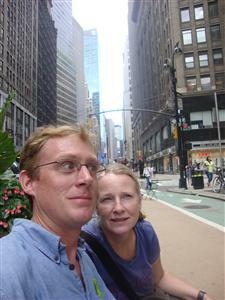 We flew via New York on the cheapest deal we could find, which meant a 9 hour stop over. We decided to make the most of our time and caught the train into the city for a bit of tourism. After a couple of hours walking and shopping the tourists were a bit jaded. But this put a smile on their faces, along with a fat boy lunch in our 'usual' resturant under the Empire State Building. 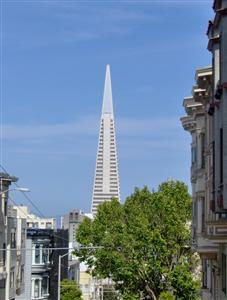 Most people visit this building to go to the top, we are usually in a hurry or cant afford the rise, so go to the basement instead for beer and burgers. 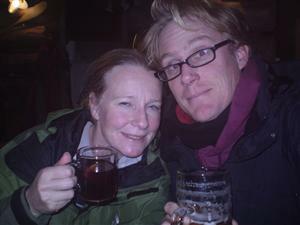 Once back in the UK we spent a few days in Bristol and Bath with Lindy, Fiona, Bill, Rory and Josie. The a rush round the UK to Kingston(Jerry), Lindfield ( Jason et al), Ipswich (Jams), Doncaster(Natalie) and finally to Ganton to see Iris and join in with her 70th birthday celebrations. 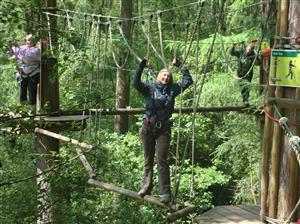 For the main event we went to a Go Ape facility which has you swinging around in the trees and travelling down long zip wires. 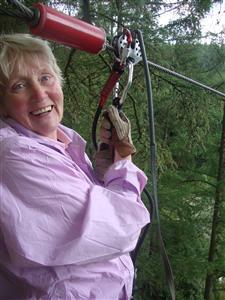 Iris managed to complete the course and here she is with a big smile about to jump from the top of a tree to zip wire 200ft above the car park. We had a wirlwind 10 days in the UK, but managed to catch up with many of our nearest and dearest.. so on to Canada and a new adventure. We had reached the southern most tip of our winter adventure, and thought we had better head back to the USA to find some work to fill up the cruising kitty. We still had a month to get back to time to see some more on the way back. Getting better at catching them. Two in one go. In a stop in our favourite Saddleback Cay we managed to bag two lobsters in one trip, good for us as we didnt tend to spend long in the water as we had no wet suits and we didnt go to far from the boat with our small rib. 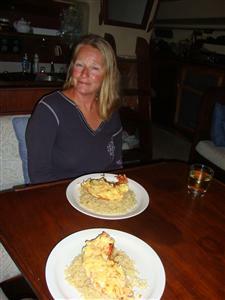 Di made some lobster thermadore with this one. 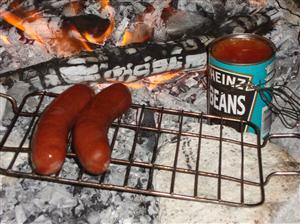 I also love them on the BBQ with some butter. Dis definition of a good life is two bikinis on the line. Even is this climate your bikini is not dry from your first swim of the day before you feel obliged to jump in again. We also had time for some boat work. Here Di is seen with all her recent creations, the two new sail cover/stack packs, the bimini cover and the cockpit cushion covers. Finally getting rid of the dated blue canvas look. 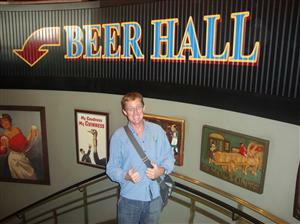 After the Exumas we stopped in Nassau for some more traditional tourism. 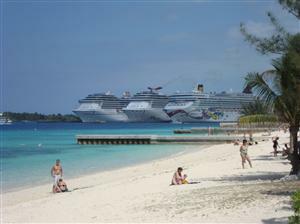 Very busy side of the Bahamas that is all that most tourist see. A shame for them, but keeps the rest of it quiet for us. 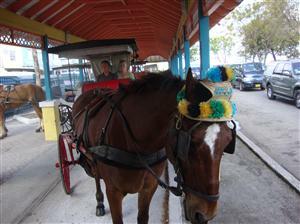 Horse carriage rides are a Nassau tradition. 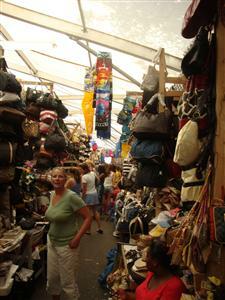 The straw market is another Nassau 'must see' although all these attractions clustered around the cruise ship terminal make it busy. 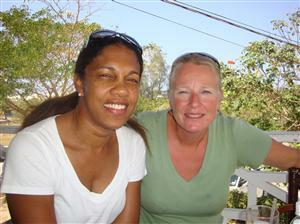 Through the wonders of face book Di found an old school friend Diedrie (Deedee) Graham who lives is Nassau. We met up with her and met her family. 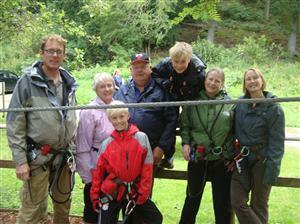 It was great to have a local guide and to see some family life. 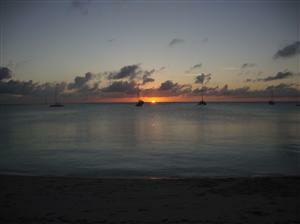 We had dinner at the cricket club, drove around the back street of Nassau and had a lovely family dinner. Leaving Nassau we were not sorry wave goodbye to the cruise ships and the crowded beaches, the noise and the polution and head on the the Berry islands for a final fill up on quiet. 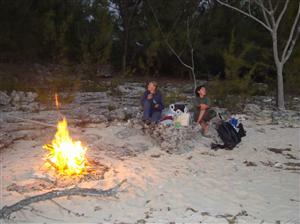 In the berry islands we managed to find some peaceful places a couple of beaches and even time for a fire or two before a trip back to 'real life' of working. 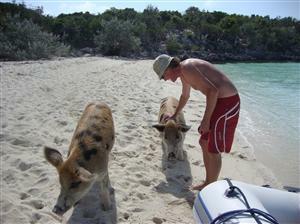 We left Georgetown and the crowds of cruisers and headed to the Ragged Islands, or Jumentos Cays as they are also known. 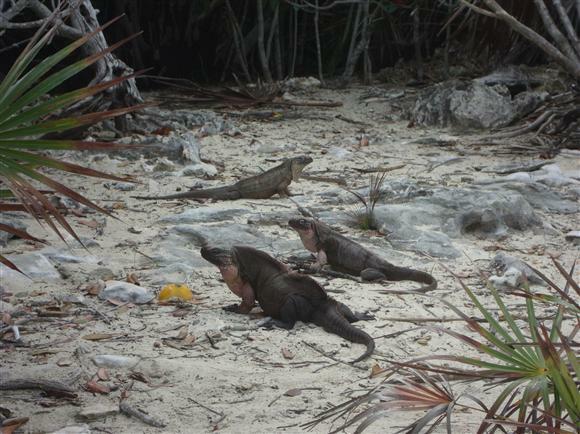 These Cays are less inhabited, more spread out and with less shelter than the Exumas, so in theory quieter and off the beaten track. There were still a few adventurous boats to be found wandering in packs as was to be expected as it is the one of the 'uncharted' areas that have just been charted! The water was as blue as ever, clean and full of fish. 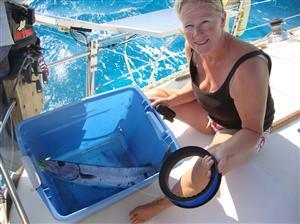 Mainly we caught Baracuda. Scary looking and often not good to eat as they have poisonous ciguatera they retain from reefs, we took no chances and put them back. On most of the Islands we saw no-one, the occasional pack of cruisers all huddling together. We got weather forecast from an old SSB radio. Although we had no proper antenea we clipped it to the rigging and managed to get good reception and enough forecast to know when to sail and when to stay. 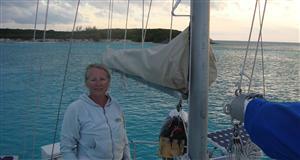 Di had finished the sail covers and SeaGal looked smarter every day. 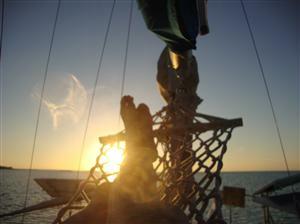 Most days were spent sitting at anchor, with the occasional sail to a new Island. A few walks and swims ending in a BBQ. 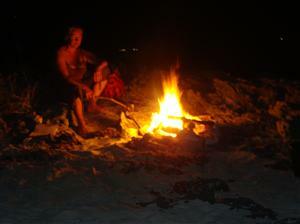 Our favourite evenings were spent sitting on the beach burning drift wood, enjoying BBQ lobster and Conch and a cold beer. 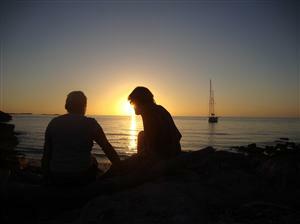 Then watching the sun set over the boat and wondering what to do the next day. Swim, sail, fish or bugger all. 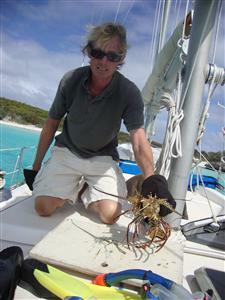 We eventually found or first lobster and after an underwater Chase managed to catch him. Slowly getting braver, sometimes even without the gloves. 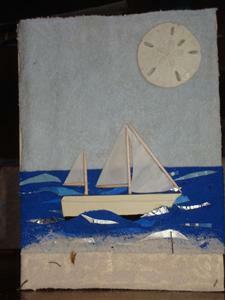 Di made this fantastic B'day card for one of her nephews with bis from the beach and the boat. Old main sail and topside paint made the boat come alive. The next Island was Waderwick Well, which is also the headquarters for the Land and Sea Park. Many days amusement was has listening the people on the radio calling up Waderwick Wells and me thinking of the Monty Python 'Welease Woger' scene from Life of Brian. The park had many moorings, but charged lots of money, so we anchored near to the park headquarters and had a much more peacful time. 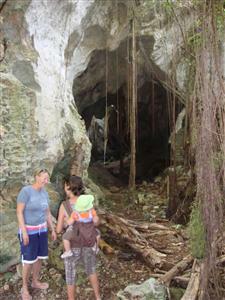 We walked the trails ashore to explore the natural beauty and to get into holes with trees. Di continues with the sewing projects, here making the main stack pack. I made some new screens for the companion ways. 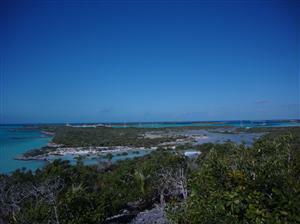 Further south was Staniel Cay. We made sure to visit the swimming pigs, who were enthusiastic to see us at first, then just lay down to sleep as soon as they realised we didnt have any food. Scrubbing the bottom of the boat standing on the ground. 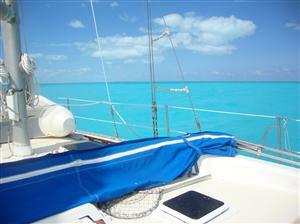 We found another difficult to enter anchorage with very shallow water in behind Thomas Cay in the Pipe Cay channel. 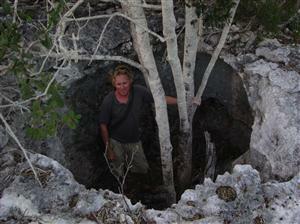 JUst deep enough for the boat to float and shallow enough to stand and scub its bottom. 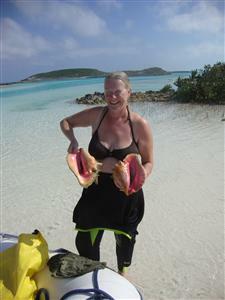 In Staniel Cay we met up with Paul and Liz again who took us Conch hunting. They dont run fast, but the bigger ones seem to be in the deeper water so take some finding. 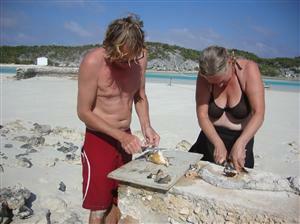 After diving to find our fill we went to a beach to receive instruction on how to extract the meat from the shell and which bits to eat and which bits to chop. Lots of work cutting slimmy skin off. 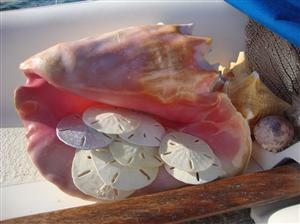 The end results were lots of tasty conch fritters. Further South is George Town. The end of the line for many as they spend the winter here. 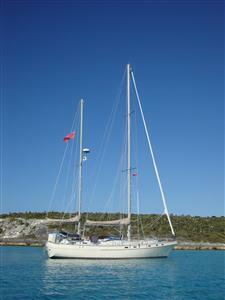 There is a large sheltered anchorage, shops, water fuel and a lively social life. Although an idilic setting it didnt feel very away from it all with so many others in the same spot. Trying to find a spot for you dinghy on a beach was never a problem before. 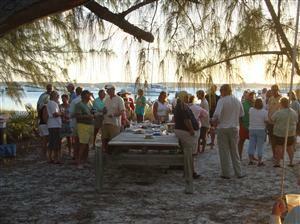 We took the opportunity to fill with food, rum and water and even had time for some socializing. Here at a 'bring a plate' ( with some food on it) to a rather lovely beach. 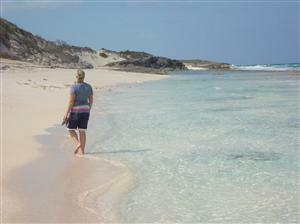 It was still easy to find some peace and quiet if you walked for 15 minutes to the other side of the island. 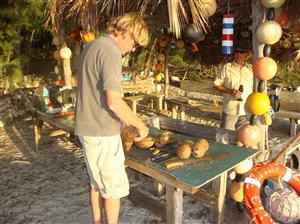 Paul and Liz took us to a driftwood bar made on the beach and amused themselves watching us trying to get into some coconuts. 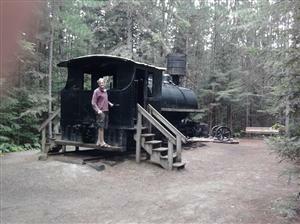 After a couple of weeks it was time to head on south to some less travelled paths. 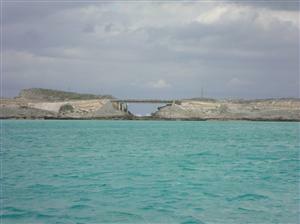 We had reached the end of Eleuthera, the weather was getting better, it was time to cross to the Exumas. 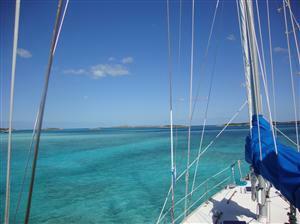 We had a beautiful crossing and anchored behind Ship Channel Cay. 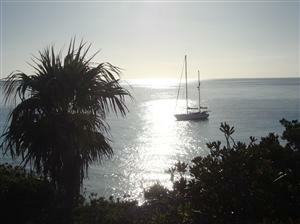 Not a great anchorage and a bit rolly for our little boat. 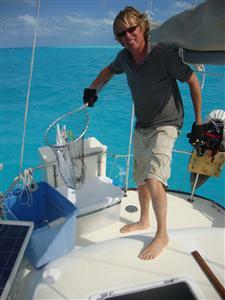 Then next day we moved to the smallest anchorage we could find. We had to enter at high tide, and then we only had 5ft of water. Difficult to enter, but very sheltered and quiet. 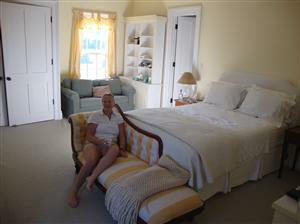 We spent a few days relaxing and swimming. 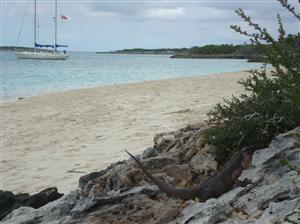 The next stop was Allens Cay, famous for its Giant Iguanas. The anchorage got pretty crowded as it was the normal first stop from Nassau. 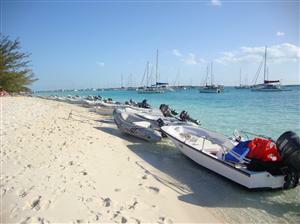 Every afternoon tripper boats would unload on the beach for 10 minutes, then rush off and leave us in peace. We bumped into Paul and Liz from Jalan Jalan who we had met in Rock Sound. 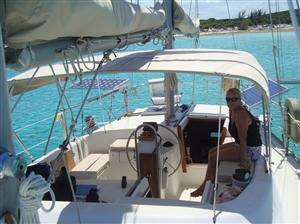 An english couple who had been around the world, and now sail just around he Bahamas. The english humour took a while to remember, but we soon remembered how to be dry,sarcastic and talk about the weather. 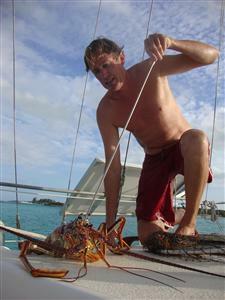 Paul turned up to our boat with a spare lobster tail. 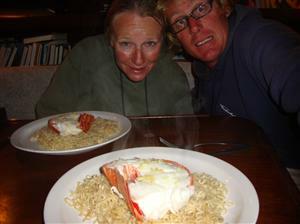 He had ben fishing and got a bit carried away, so we helped him out and enjoyed our first lobster dinner, of many. 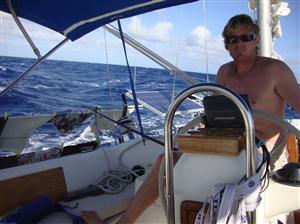 Further south we found our favourite anchorage, deserted due to the difficult entry, but sheltered. 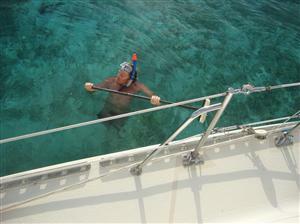 Plenty of snorkling, with a few lobsters to find. A well on the island for fresh water, what more could you want. The first Stack Pack made, and its maker. 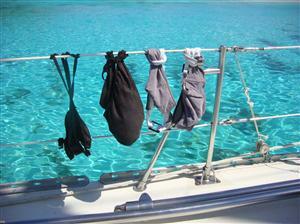 DI found a few days to concentrate on the project of renewing all the blue canvas on the boat. 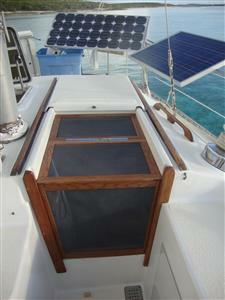 With the cockpit cushions completed, the next was the sail covers. We decided to make Stack Packs so as to make the large main easier to control. 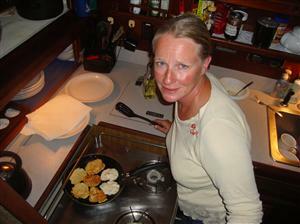 Di made the mizzen stack pack first so as to practice the design on a smaller scale. It looks and works like a dream. Next stop was Shroud Cay. 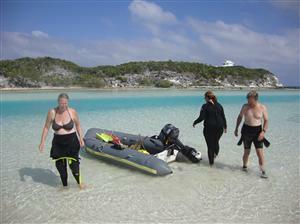 This first Cay in the Exumas Land and Sea park. 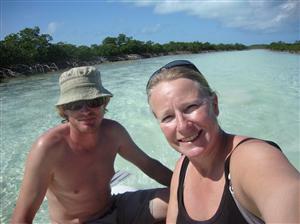 We explored the rivers and mangrove swamps in the dinghy. 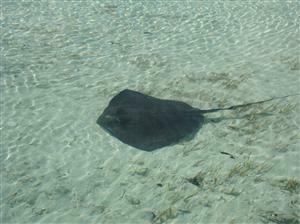 We followed this friendly ray through the island as he showed us the deeper parts of the river. At the other side of the island where it meets the ocean was a beautiful pool for swimming. 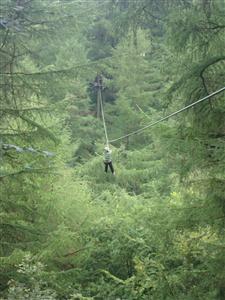 AFter a hard days exploring there was just one thing lef to do. 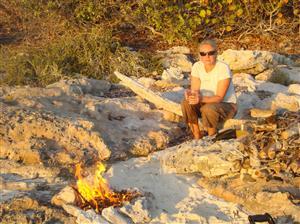 From the Abacos we thought it time to head further south in search of warmer climes. 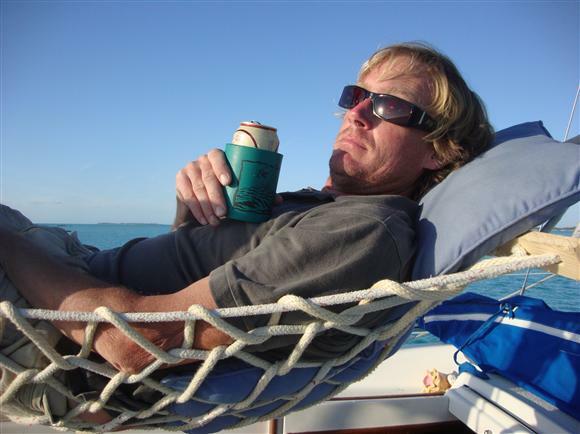 We crossed to the North of Eleuthera from Cherokee Point to Royal Island in the company of several boats all choosing the windy Northern weather to fly accross, rather that the prevailing southerly. 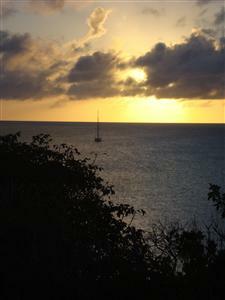 We would meet up with with many of these boats time and again as our paths crossed on the voyage south. After Royal Island we went through current cut and crossed to anchor near this bridge that joins two parts of the Island that bairly touch. It is known as the glass window. 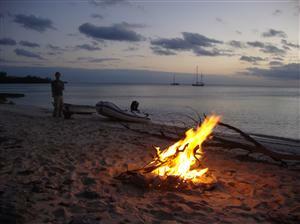 That night we invited the crew of Vontana, Ryan, Alexis and Luma, to our first beach BBQ, first of many. We continues south, found some very cheap moorings in Hatchett Bay, some very cheap rum in Governers Harbour and then ran to Rock Sound to hide out another weather system. 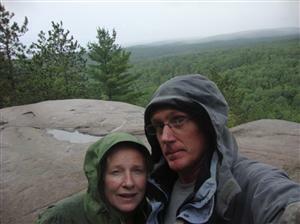 This picture taken when we went ashore for a picnic to escape from cabin fever. Maybe not such a good idea after all. 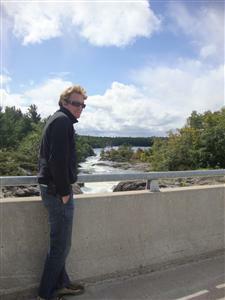 As the weather improved we explored this town and surroundings. 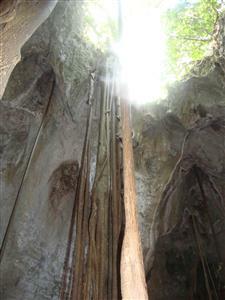 This cave system south of town has some amazing root systems growning down ito it and was a great place for a picnic with our new friends.